The last year or so has seen some hugely positive inclusive rugby league stories. Following the huge success of Physical Disability RL, we have seen the launch of Learning Disability RL teams. Such enlightened developments are driven by league-lovers affected by such challenges. Most are people you have ever heard of. But occasionally, someone involved can grab the public’s attention. In the case of the Colostomy UK RL team, they can now reveal a high-profile figure to draw the spotlight on their cause. For those of you who are aren’t familiar with the terminology, stoma surgery is used in the treatment of a range of conditions including cancer, Crohn’s disease, colitis and diverticulitis, or following abdominal trauma. It involves diverting the bowel or bladder through a surgically created hole – known as a stoma – in the abdomen, so that bodily waste can be collected in a bag. People with stomas are often referred to collectively as ostomates, of which is estimated that there are around 120,000 in the UK, that’s about one in 550 people. It’s not just an old person thing: babies, women, boys, girls, and even professional athletes have the surgery. In the 1993-94 season, when Anderson was an exciting young prop for Halifax, he developed an abscess in his bowel which refused to heal. The unpleasant, debilitating symptoms grew progressively worse over 18 months until he was pretty much incontinent. The physical and mental toll was considerable and by the end Paul says he was desperate. In a sign of the times, despite being a contracted first team player, former Leeds junior Anderson was only on a pay-as-you-play contract. He was full-time with no other job. Having no income was just part of a potentially disastrous set of circumstances. Once he was back from his colostomy surgery, Anderson was then out for another three months with a shoulder injury which also required knife work, during which time his career – and life – to a major twist. That was 1997, a few months after Anderson had been side-lined for two years and got married while attached to a stoma bag. In two years he had reached a Super League Grand Final and been capped by Great Britain against Australia, another two and he had played in a World Cup for England, won the Grand Final and the World Club Challenge. By the time moved from Odsal to St Helens, Anderson had played in five Grand Finals at Old Trafford, winning twice. He added another Super League ring to his collection in his final ever pro game, completing the double with Saints in 2006. Colostomy surgery is often a lifesaver or improves lives. It definitely changes them. People have to learn to live with their stoma and how their body looks and functions. Ostomates have to learn to endure the stigma of having a ‘bag’, from negative media portrayals to cheap gags which add to the mental and physical demands of major surgery and illness. The impact of public ignorance, inadequate public facilities, post-op body image and stoma management can have a longer term effect. Mental health can suffer. Some ostomates even feel suicidal. Others become isolated and shun social interaction. But Anderson is able to look back quarter of a century and be glad he had it. This year 13,500 people will undergo stoma surgery. They will be frightened and fearful of the future. Many will feel desolate and without hope. Some of them will be rugby league fans, others will be current players. 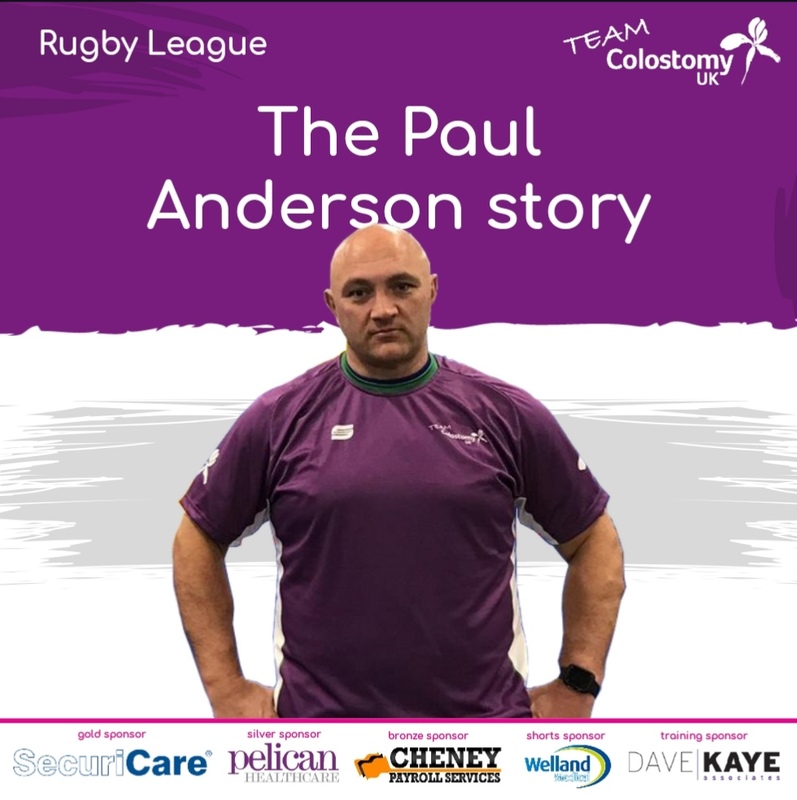 That is why Colostomy UK set up ‘Team Colostomy UK’ their own team last year, playing games at Medway Dragons, South London Silverbacks and Featherstone. Current professional players Ben Kaye of Halifax and Jy Hitchcox from Bradford Bulls are on board, and they may even get Baloo to make a guest appearance. “I’m not sure I’m ready to pull the boots back on but I’m committed to help anyone I can help out there. When I saw on Twitter that Colostomy UK had a team I thought ‘really? !’ It’s unbelievable as it’s not that well known out there. I told them I was a former patient and if I can help the issues become more recognised, all the better. Anyone who plays with a stoma, or the PDRL team, or have anything wrong but just get on with their life, I have the utmost respect for. Most people without any physical challenges just take things for granted. Written By Gavin Willacy, Richard Biddle & Giovanni Cinque. Read the full story in 40-Twenty magazine. Available now in WH Smith’s and all good newsagents.